Pedro. I forgot to mention this before, but one of the reasons I think that these "targes" were large pavise-like shields, comes from William Patten's account of the Battle of Pinkie Cleugh. Here is the account (written with modern spelling). "Near this place of onset, where the Scots, at their running away, had let fall their weapons (as I said) there found we, beside their common manner of armour, certain nice instruments for war (as we thought). And they were, new boards ends cut off, being about a foot in breadth and half a yard in length; having on the inside, handles made very cunningly of two cords ends: These a Gods name were their target against the shot of our small artillery, for they were not able to hold out a canon." This description sounds a lot like the targes of board mentioned in the 1456 legislation. Notice that these shields were used to defend against shot from the English canons. This is why I think that they were large heavy shields. Of course these shields were not very effective. Also Patten's account states that these shields were found around the Scottish banners, so perhaps they were specialized equipment for protecting the banners. Using shields to protect against mid-16th century cannonballs is absolutely madness, specially since they were made from wood. And from what I undestood from the account, the scots weren't actually intending to use the shield against the canons before they forced to. I don't think a shield with such mensures (1 foot in breadth and half yard in length) is something that closes to the dimensions of a pavise. The thing is actually quite small, in my opinion. 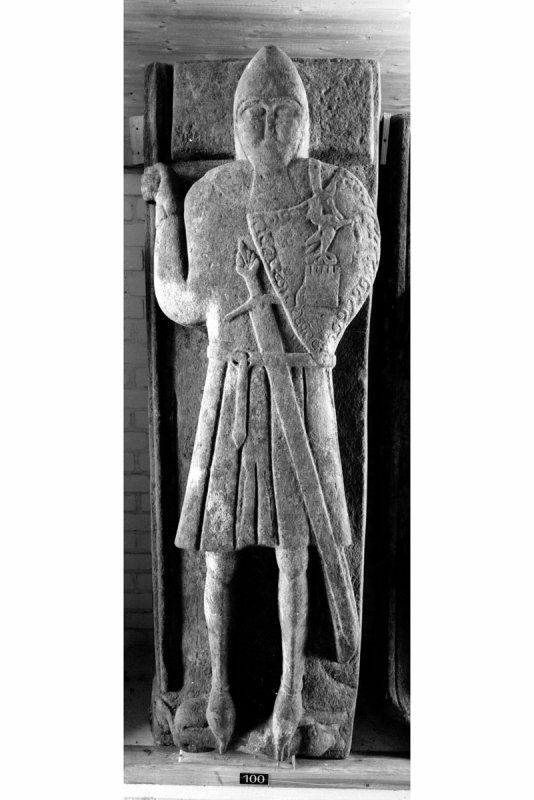 But regardless of size, if scots were using large shields by mid-16th century, I would argue that those are likely to be contemporary introductions rather than a tradition. I'm saying that because the dutch had their version of spanish rodeleros armed with large targets to protect against pikes and firearms more or less by that time (those shields being made of steel rather than wood). If dutch pratice wasn't exactly an innonvation AND the size of these shields actually match to pavises, then it's likely that scots were using pavises for a time until that battle. Yes I agree. I think that when medieval Scottish pikemen used shields, then they were probably using heaters. However by the time that we have legislations which mention targes, Scottish pikemen seem to have abandoned the use of shields other that some using bucklers. These targes are specifically mentioned as to be used by axemen, not pikemen. Also the fact that these targes are described as being made from either wood or leather (not both), and the fact that examples of these targes had to be sent out to each shire, leads me to think that these were a type of shield not familiar to the general public, and so I don't think that these 15th century targes were what we would call heaters. Side note; I don't think that their is evidence for Highlanders using heaters as late as the 16th century..
Do you know when they stop using heaters? It might be usefull for another subject I'm reasearching. In any case, can you make a shield just of leather? From what I learned, they used leather as covering for the shields, instead of using then a sole material for that, purpose being decoration and protection against fire. The legislation usually places three options for the yeomen: be armed as pikemen, axemen or longbowmen. Interesting to notice that those legislations are trying to enforce the yeomen to keep and be trained in one of those arms, just like the english. So everyone of these could be soldiery material (and more professional ones, since english yeomen formed the more skilled part of longbowmen in their armies). You questioned why the legislation makes reference for yeomen who couldn't "draw or shoot a bow", and I believe the reason is behind culture and training: in England, almost everyone had a bow and maintained some minimal training with it. Training was also enforced to yeomen (and perhaps other people of lower status). Because of that, english lords could rely on a good and abudant source for soldiery material, since longbows were already widespread and the english folk had training with them. Training is a main factor here, because proper warbows required extensive training from the light bows to the heavier and war-like ones. Someone who didn't have much longbow training, even if he was physically stronger, couldn't draw a bow. Then, you the legislation recognises such reality in Scotland and told the yeomen to choose the other two categories. Important to notice that France also made definitive efforts to make a national source for longbowmen by 1440 with the franc-archers. Thing is, they weren't that extensive in numbers (but did a great job in anullying english longbowmen at Formigny) and were often refered as "useless" and "cowards" by other frenchmen. Then you have another problem that France eventually employed arbalests as "franc-archers", so they eventually consisted both of longbowmen and of crossbowmen. Scottish provided good source of longbowmen to the French Crown: they formed a considerable part of the french archery in major battles and the most famous household guards of the french kings were ... scottish (in an 1470's occassion they were mentioned shooting arrows at a nobleman, context being the start of the wars against Britanny and other french vassals). With all that, I'm intending to argue that: putting legislations to enforce archery isn't guarantee of sucess. About the percentage problem, I believe that could be +/- estimated by knowing the "appearance" of a contemporary scottish army. For the sake of example, most countries would rely in a up-to-down style of recruitment: prefering the skilled and better armed soldiery material and just then recruting the more poorly armed material. I know that - at least from late 13th to late 14th centuries - scottish armies were usually - if not always - composed of unpaid volunteers. That doesn't exactly means they were good armed: as mentioned before, there were plenty of soldiers poorly armed to"english pattern"; without helmets or gamberson, and using minimal arms. That's why early 14th century legislations started forcing pikemen to have gamberson, helmet, sword/axe and buckler, because scottish poorly equipped formations were vulnerable to longbowmen's shot; those who were targeted in the legislation, although I'm not familiar with what "middle class" would be in Medieval Scotland, were certainly not the classic servant, perhaps they would be of the burghers, town workers and yeomen's economic condition. If scottish armies followed the same pattern of the generic style of european armies, these classes of people would be a expressive part of the army (if I'm not mistaken) in generic conditions. Since they were targeted by the legislations, they would be expected to have the equipments listed in the ordinances. Of course that doesn't mean they would be likewise armed from what Crown demanded, since we have examples of theory x pratice of these legislations (e.g. : Dutch Rondassiers). But, given what I said and having in mind the Crown OFFERED a option between longbowmen, pikemen and axemen, I believe we actually should take their proportions seriously. By the way, from what I know to other european armies, banner guards were formed by skilled veterans and professionals, as they were put in Swiss Armies (voulge men and halberdiers) and Landsknecht companies (doppelsoldner armed with Zweihanders and Halberds). In Portugal, skilled people were put to guard the flags, one of them, Duarte de Almeida, was a war hero and is recorded holding the stardard with his own teeth after the loose his both hands to sword-cuts, he's also the standard bearer in Afonso V's african campaigns (as shown in Pastrana Tapestries). There is no sense in creating legislations to put yeomen to train so they might become flag-guards. It's likely they would employ already veteran material to guard those; Heath mentions shield-armed men with leather covered shields guarding a scottish standard in a 14th century army, due to the quality of their shields, it's likely they would be household troops of nobles or other veteran soldiery). Leather facing would change that much? Given Patten's account, I believe it's somehow secure to speculate that they would be in some considerable numbers. Heath mentions, though I don't remember if the based this in the Tapestry, that Huscarls would likely put their shields at back when using the the dane axe. Also, I have see many illustrations e reconstructions, one of the latter made by Timothy Dawson in 11th century norman equipment, that kite shields could or had strappings that allowed them to use a spear of an axe with two hands while the shield was being held in one of the arms. Interesting to notice that he actually mentions shields in 16th century as possibilities in pike formation (probably cause they were still being used), but due to the time he wrote, shield armed pikemen were probably old-dated to this time. I agree, using shields against cannonballs is a bad idea, but so is using oversized baby's rattlers to try and scare the enemy's horses, and yet according to Patten this was also done by the Scots at Pinkie Cleugh. Perhaps I need to reread the text but i didn't get any impression of what these "targets" were or weren't intended for. Could you tell me what gave you your impression. I don't think a shield with such mensures (1 foot in breadth and half yard in length) is something that closes to the dimensions of a pavise. The thing is actually quite small, in my opinion. What I propose is that the dimensions given by Patten (12" x 18") are those of a single wooden board. 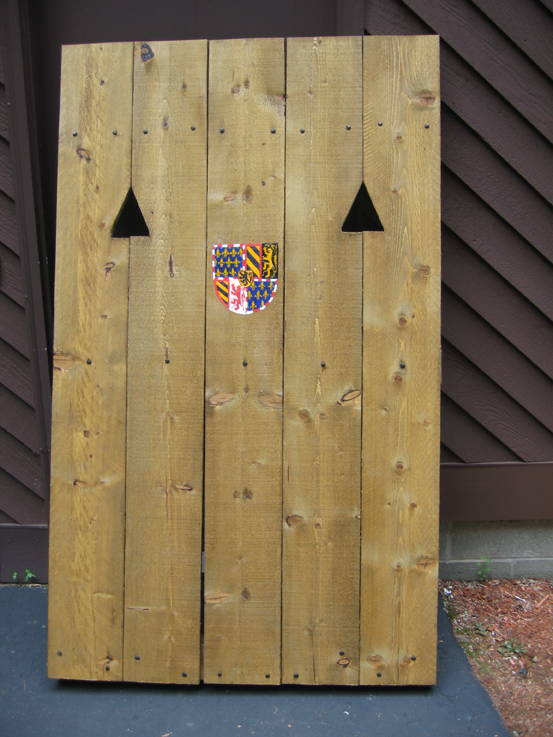 A large a shield could be constructed from many of such boards. After doing a bit more research I've found a type of shield, known as a mantlet, that is similar to what I think Patten may have been describing. Here is an example of a mantlet. Unfortunately I don't know when exactly Scottish pikemen stopped using shields. Yes you can make shields of just leather, the Moorish adarga is a good example. I'm not saying that Highlanders didn't use heater shields, they did. What I'm saying is, I'm not sure if they continued to use them into the 16th century. 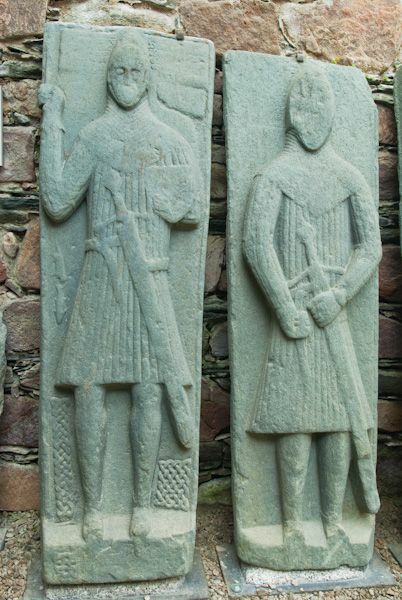 Of the couple of grave slabs I've seen that have both a heater shield and a date carved into the stone, they have all been 14th or 15th century. That isn't to say that heaters definitely weren't used by 16th century Highlanders, but I haven't seen any evidence to say they did. You questioned why the legislation makes reference for yeomen who couldn't "draw or shoot a bow", and I believe the reason is behind culture and training: in England, almost everyone had a bow and maintained some minimal training with it........ Important to notice that France also made definitive efforts to make a national source for longbowmen by 1440 with the franc-archers......... With all that, I'm intending to argue that: putting legislations to enforce archery isn't guarantee of sucess. Heath mentions shield-armed men with leather covered shields guarding a scottish standard in a 14th century army, due to the quality of their shields, it's likely they would be household troops of nobles or other veteran soldiery). Could you tell me more about this or share a link to what Heath had to say. In a TVs show called Weapons that made Britain Mike Loades did some tests where he shot arrows two "Viking" style shields, one with a leather facing and one without. The leather covered shield performed significantly better than the non covered shield. I don't think that it is at all secure to speculate, given Patten's account, that there were many of these shields at Pinkie. As you said Pedro the fact that axes and targes are mentioned in legislation as an alternative weapon set for yeomen who could not shoot a bow, suggests that they were not used by specialist troops. Come to think of it I've seen other 15th century documents which talk of spearmen, bowmen, and axemen, this suggests that axemen were considered a standard troop type. IF the "targets" mentioned by Patten were the same as the "targes" mentioned in 15th century legislation, then they must not have been as widely used anymore, as there is no mention of them in the legislation of 1540 (7 years before the battle of Pinkie). "every noble man, such as an earl, lord, knight and baron, and every great landed man having £100 of yearly rent, be armed in white harness, light or heavy as they please, and weaponed appropriately to his honour, and that all others of lower rent and degree in the lowlands have jack of plate halecret or brigandine, gorget or pisane, with splints, paunces of mail, with gloves of plate or mail, and that all others of our sovereign lord's lieges, unlanded gentlemen and yeomen, have jacks of plate or halecrets, splints, sallet or steel bonnet, with pisane or gorget, and every man with sword, and that no manner of weapons be admitted in wappenschawings but spears, pikes strong and long of six ells of length, light axes, halberds, handbows and arrows, crossbows, culverins, two-handed swords"
One interesting thing to note is that according to Patten, both Scottish commoners and noblemen at Pinkie were wearing jacks only, whereas at Flodden decades earlier many had been wearing plate armor. I suspect the idea was that the combination of jack and target would be good enough to protect against longbow arrows while at the same time being lightweight and flexible in close combat. However this wouldn't have helped much against the mercenary harquebusiers, canister shot, and naval artillery being used by the English. Bullseye of you. Thing is: in England and continental europe, a mantlet is also called "a pavise". Given that names like pavise and targe are misleadingly used as a "generic shield" at some particular culture, it's highly possible that that "targe" in Pinkie would meant a mantlet. Also, just for having a turning on, there are references for "targe draghers" in netherlandish military documents from late middle ages. Those were interpreted by Heath as regular pavise-armed infantry, probably armed with spear of normal length (like those of parisian milita). So there isn't a contradiction in scotish pavisiers at least in linguistic grounds, so our discussion can be focused in other aspects of this proposition. Now, whether it's sieges or pitched battles, mantlets were designed as protection from arrows and bolts. Given the englishmen didn't abandon the longbow as a main weapon even by that date (specially in Northern Earldoms), sounds fair to speculate that those mantlets were designed to provide cover from english longbowmen shots. What troops would be using those shields, since there's no specific mention in the primary sources, makes me think that those would be rather harquebusiers and longbowmen than meéle infantrymen. They could be musketeers too, but I don't think Scotland would be THAT forward-looking by this date; the spanish, for example, rarely employed muskets in open battles except if they were place in trenches (the Tercios by 1550's would be a innovation). Given the english realise they should nullify the mantlets, they use the cannons to destroy them, so we can draw one logic conclusion from the case (specially because it's likely they were few and provided good target for cannons). I'm quite sure there wasn't much of plate armor in scottish army besides among men-at-arms: scottish armies were known for their lack of armor. The french knew that and often provided imported munition grade armor or captured armor. By late 15th century the situation was so hard that the King created great power watermills to produce armor for their army. But even by Flodden there wouldn't be much armor among non-noble scots. Actually, it was plate armor that actually made men-at-arms unable to fled the fight due to the nature of the field. Padded armor, however, was being enforced into scottish yeomen since early 14th century, so I would argue it was rather a decrease in plate armor instead of changing it to jacks due to their efficiency. That's a "mea culpa" from my part, because what Heath actually says is that the scottish shields carried at the Standard (ie. the Battle of the Standard not the standard itself) were made of tanned bull's hide, so every soldier armed with those shields had these coverings. Still, that doesn't changes the contemporary concept of putting veteran soldiery to guard the standards. The quote itself I actually posted it in the previous page of our discussion. I would say the standard troop type would be the pikemen, then followed by the axemen. Don't get me wrong, axes were really popular among scots as much as it was among the norsemen. English chroniclers at the Battle of Bannockburn describe the scottish foot as armed with helmets and shields, "light but sword-proof armour, axe at side and spear in hand", something that Chris Brown also mentions in his book (Bannockburn 1314. Stroud: press. p. 78. ). I already mentioned that King Robert de Bruce had a collection of axes and used one of these to slay an english knight in the most famous account of his life in war. Axes had enough proeminence to figure in Froissart's description of the Battle of Nevile's Cross and Outterburn. Heath also states something similar (though I had heard those informations in Osprey's books about anglo-scottish wars), as you can see in the file below. Given that scots used both one-handed and two-handed axes, but the reason I'm saying pikemen were the majority is due to the description of the battles were schiltrons are the focus of the chronicles. It's likely that shielded axemen would be placed in the flanks with the archers or could be deployed as fornlorn hope, but perhaps you might have a different opinion or sources in the matter of what exactly did the shielded axemen did in scottish army. I have serious problems with these legislation. Wasn't lord synonymous to "earl and baron", it's quite redudant. When it says "light or heavy as they please", what types of armor it's intending? 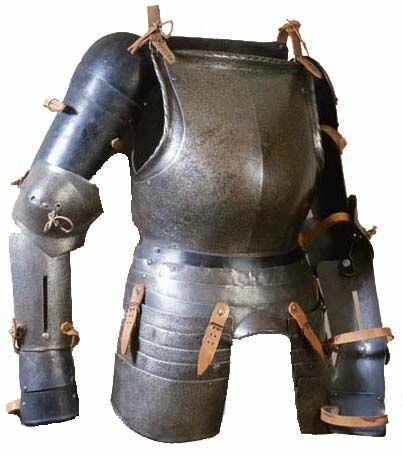 When I google "halecret", I find descriptions of a brigandine, so I don't know if it was a similar armor or the legislation was using both terms analogously to each other (or perhaps it was the same of "Jack of Plates"?). The period accounts of Flodden Field 1513 indicate Scottish pikers wore considerable plate armor. Come to think of it I've seen other 15th century documents which talk of spearmen, bowmen, and axemen, this suggests that axemen were considered a standard troop type. I would say the standard troop type would be the pikemen..... but the reason I'm saying pikemen were the majority is due to the description of the battles were schiltrons are the focus of the chronicles. It's likely that shielded axemen would be placed in the flanks with the archers or could be deployed as fornlorn hope, but perhaps you might have a different opinion or sources in the matter of what exactly did the shielded axemen did in scottish army. Certainly pikemen were by far the most numerous of any troop type in Scottish armies of this period. What I meant by calling axe-men a "standard troop type" was that they most likely didn't perform any specialised tasks such as guarding banners (as you rightly pointed out). They were standard troops in the same way that archers were standard troops. I imagine that there were probably less axe-men than archers, and we know that Scotland didn't field very impressive numbers of archers. As for where these axe-men were deployed in combat. My guess would be that their role would be to protect the archers. I image that they might have deployed in front of the archers, making a wall with their shields (targes, pavises, manlets, whatever you want to call them). The archers could shoot over the wall of shields, and if the enemy got close the axe-men could deal with them. Well it says "white harness" so I assume it meant good quality full plate armour. The online dictionaries I've consulted say that "halecrets" were a form of light or lesser quality cuirass, probably something similar to "Almain rivet". Here is an example of "Almain rivet" with "splints" (arm protection). "The said Scots were so plainly determined to abide battle and not to flee, that they put from them their horses and also put off their boots and shoes, and fought in the stockings of their hoses every man for the most part with a keen and sharp spear of 5 yards length, and a target before him. And when their spears failed and were spent, then they fought with great and sharp swords"
I suspect the idea was that the combination of jack and target would be good enough to protect against longbow arrows while at the same time being lightweight and flexible in close combat. Yes it seems that the Scots learned a lesson after Flodden. That lesson being that the time for infantry armoured in heavy full plate was at an end. The legislation of 1540 stated that noblemen were still supposed to wear "white harness", but as you say Patten tells us that many noblemen chose to wear brigabdines and jacks. Incidentally this lead to a higher than normal percentage of noblemen being killed because their clothing, arms, and armour were indistinguishable from those used by commoners. When the quoted source states they were using those arms, you might have noticed that "rivets" (imported almain rivets from Germany), jacks, splints and other equipment are all diferent types of armor that can't be used together. To make it clear, some soldiers would be wearing full harness, others with jacks, other with rivets and so on; those being relative to the social condition and military rank in the army at the time. Since the french was providing the bulk of the equipment, King James had most of his troops with armor. 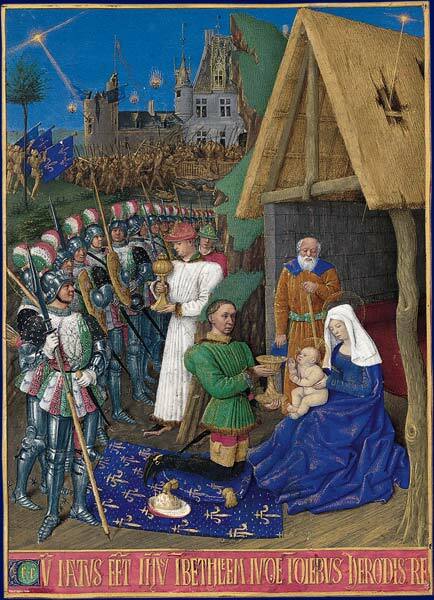 The elite would likely already have its own armor, and the poorer troops would pick the State provided equipment (both from the local produced munition harness after the creation of a scottish armoury in late 15th century or from the french supply). According to the traditional scottish, german and swiss pratice, the most heavily armoured men would be placed in the foremost ranks, like the german landsknecht at Stoke Field (1487). Since 14th century there was a traditional idea that the place of the scottish nobility in battles were in these vanguards, among the other heavily armoured men-at-arms. Considering that the most better equipped troops were placed in the fronk ranks, and other scottish soldiers who were not men-at-arms or nobility would too be equipped with imported armor, it's undestandable why longbowmen's volleys were ineffective (not to mention the pavises which are likely to be mantlets since their were made with such size of wooden boards). Yes it seems that the Scots learned a lesson after Flodden. That lesson being that the time for infantry armoured in heavy full plate was at an end. The legislation of 1540 stated that noblemen were still supposed to wear "white harness", but as you say Patten tells us that many noblemen chose to wear brigabdines and jacks. Incidentally this lead to a higher Thanks normal percentage of noblemen being killed because their clothing, arms, and armour were indistinguishable from those used by commoners. I wouldn't say it was a lesson. If there was any to be learn, then it would be bill's superiority against pikes at irregular terrain, not the armour. The main difference regarding Flodden and the latter campaigns was simply the french actual support for the earlier one. The french provided the captains, the armour and even the pikes of italian manner. Descriptions of the battle posted in the link above says the scots were fighting in the "almain manner" (i.e. german manner), even fighting in "silence" according to the swiss/landsknecht manner. King James of Scotland had an landsknecht/swiss style army composed of native soldiers, not the regular situation you usually have in the other battles (and probably the one at Pinkie too). However, I can't explain why armor declined more easily in Scotland than in other parts of Europe. I have a thesis that "full armor" made of paddings might have proved itself a way better protection against longbowmen massive arrow shots than half plate armor, which would render parts of the body exposed; but that's a subject for another discussion. As you yourself said Pedro, the Scottish elite at Flodden probably already owned their own harnesses. This means that the armour supplied by the French had little bearing on the equipment of the elite. It seems that these men chose to wear lighter more flexible armour at Pinkie. My thinking was that perhaps, after Flodden, the Scots thought that the protection offered by expensive full plate armour was no longer worth the weight. Oh and here's another example of the word "targe" being used in a very general way. I think this came from Boece's Chonicles of Scotland, but anyway when describing how the Emporer Hadrian built his famous wall in Britain, the author calls it a "targe" against the Picts and other tribes in Scotland. King James of Scotland had an landsknecht/swiss style army composed of native soldiers, not the regular situation you usually have in the other battles (and probably the one at Pinkie too). James IV did not have a "landsknecht/swiss style army ", his army had neither the organisation, tactical training, officer or equipment found among the Swiss and the Landsknechts. Arming his men with imported pikes and forming them into square formations is not the same as having a force in the Swiss or Landsknecht style. manner, without speaking of any word. division. The Scots are said to have lost 10,000 men overall. upon Lord Howard. This force, together with the Earls, all perished. fighting employed by the Scots passes unremarked, but the tool of the trade, the 15-18 foot pike, is noted. English bill, with both a cutting and thrusting edge, was far handier. The captains brought by the french trained his army under the swiss/german manner specifically to emulate their combat style (see John Sadler's Battle of Flodden Field 1513, Scotland's greatest defeat. p. 22). The pikes brought by the french were the same the swiss adopted by the Italian Wars. Their armour was also of german origin (the rivets, the jacks and so on). Some authors have also argued that the employment of two-handed swordsmen in the flanks of pike formations were also a swiss/german introduction to scottish military of the time. They had the weapons, the armor and the captains to train the men in the intended manner, I can't see why one would complaint about such statement. The thing is, learning to fight in a specific manner doesn't mean they had time to get good at it. If anything, the confusion caused by trying to pick up a new and unaccustomed mode of fighting might have made them less effective. Look at things like the way the US tried to create an entirely new Iraqi army from scratch, having dismissed the old one; the new Iraqi army was supposedly trained to American standards and methods, but the American doctrine's stress on individual and small-unit leaders' initiative clashed with the more hierarchical Iraqi culture and the way it sees low-level leaders' initiative as humiliating or causing loss of face to higher-level commanders by cutting off those higher-ups from the decision-making process. The tension basically tore the army apart and made it perform even worse than Saddam's old army except for a minority of special forces that have been actually trained to at least match US regulars' standards. This might have been what happened to the Scots -- forced to discard their usual methods of spear fighting, but not given the time to get good at the more "modern" way of manouevring and fighting in pike formations. But back to the original question: the French "pavisiers" seem to have been most prominent at the battle of Nogent-sur-Seine in 1359, where their large shields were said to have nullified the effect of enemy (English?) arrows and allowed them to march uphill relatively unmolested until they were finally able to assault the enemy line. The forces opposing the French seems to have been a band of unaffiliated routiers but at least one account has their leader (Eustache d'Abricourt or something?) mention his (former?) fealty to the English king -- or rather the English king, whom he saw as the rightful king of France too -- while preparing for battle. His archers seem to have been English too. 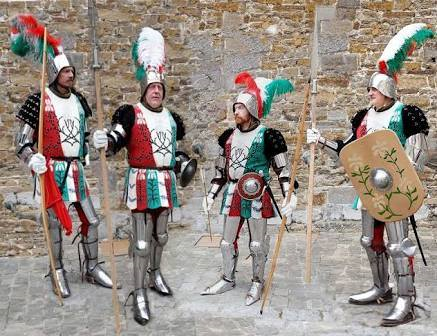 Italians usually had their pavisiers as foremost troops whose shields could cover the advance of their crossbowman. That's exactly what spanish pacifiers did too! Even as far as the Italian Wars, empavesados from Galicia would usually protect the advance of crossbowmen on field, but sometimes also of other infantry. Some of the pavisiers in the fresco of the Battle of Sinalunga (1363) shows pavisiers armed with javelins and spears (the same arms of spanish pavisiers too), so I believe it isn't unlikely that spaniards simply adopted italian tatics rather than creating their own. If we consider the possibility of this scottish targes being actual pavises, then their most probable usage was not only to protect themselves against longbowmen's volleys, but also other scottish longbowmen and crossbowmen, who were fewer in numbers and couldn't match the english at the skirmishes between each side missiles. That's my thesis. Also, according to a portuguese historian, in Spain the pavisiers also had the function of carrying ammunition to crossbowmen at battlefield. If we consider spanish pavisiers as an adoption of a italian model, then perhaps we could also consider that french and scottish pavisiers had the function of providing archers and crossbowmen their ammunation. This type of shield is of unique design, probably of scottish origin, thus rendering the details. Its date matches with the ordinances you posted. I believe this is the most probable targe the legislations were speaking about. It could also match the idea of introducing a new design of shield that obbliged every shire in Scotland to adopt it.